← How is a Haggadah like a Pocketbook? What a treat! On Sunday a large group of females aged just months old to life experienced seniors joined to celebrate a pre-Passover seder. Hearing the voices of women raised in song and conversation, watching women think what freedom means to them personally, listening to the youngest women ask the Four Questions, recalling our female ancestors-(sadly many of us no names beyond our mothers’), enjoying a Passover meal with nary an ersatz ingredient in any dish…a lovely evening. Look no further than the recipes for the food served at Shomrei’s Women’s Seder if you want something new and tasty for your seder dinner. Thanks to Lynne Kurzweil for planning this healthy, delicious, and unique meal. Hmmm…this is delicious.. But what is it? 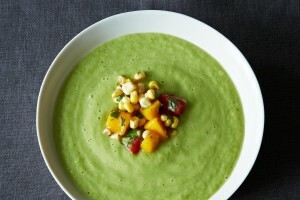 The soothing green indicated cucumber and the silky texture tasted of avocado. Delicious for a spring or summer meal. Blend all soup ingredients together in a blender till smooth, adding enough water to achieve a perfectly creamy texture (about a scant half cup, but use your judgment). Toss the salsa ingredients together in a small bowl. Transfer soup to four serving bowls. Top each with a half cup of the mango salsa, and serve. NOTE: Try using an immersion blender for the soup. Almost everyone likes salmon for its ease of preparation and its versatility. Here it pairs perfectly with one of Passover’s signature condiments – horseradish. Preheat oven to 450°F with oven rack positioned 8 inches from heat source. Place salmon, skin side down, in center of a rimmed baking sheet lined with parchment paper. Sprinkle with pepper and 1/2 teaspoon of the salt. Stir together horseradish, capers, shallot, and 2 tablespoons of the oil in a bowl until combined. Spread mixture over tops of salmon, pressing lightly to adhere. 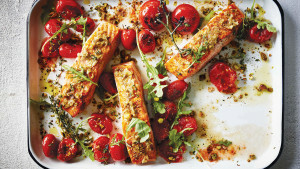 Spread tomatoes around salmon, and drizzle with 2 tablespoons oil. Roast in preheated oven until a thermometer inserted in thickest portion of salmon registers 130°F and tomatoes have burst, about 18 minutes. Increase oven temperature to high broil (do not remove baking sheet). Broil until tomatoes and topping on salmon are browned, about 2 minutes. NOTE: Make ahead and serve at room temperature. With more and more people requesting vegetarian or vegan dishes at family gatherings, this dish will make just about everyone happy. Quinoa is a chameleon in that it acts like a grain but is not. So it is permissible on Passover and becomes the perfect foil for fish and meat when rice or other grain is not available ( at least in Ashkenazi kitchens). To make the Quinoa: Bring broth and salt to a simmer over medium heat. Stir in quinoa. Stir well and bring quinoa to a simmer then turn heat to low and put lid on quinoa. Simmer for 20 minutes. Then turn heat off and let sit until ready to serve. 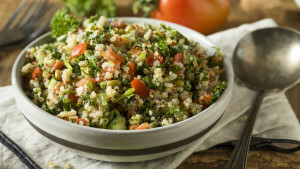 Fluff quinoa with a fork and gently stir in fresh parsley. While the Quinoa is cooking, add the jalapeno, sweet potatoes, bell pepper and zucchini on a sheet pan and toss with the olive oil and sprinkle with kosher salt. Roast for 10-12 minutes until everything is golden and tender. Mix everything together, including the shallots. Make a bed of baby spinach and then pile the quinoa salad on top. Serve. Kale is so healthy. Who would expect it to go so well in a salad. Because it is also sturdy, it stands up well to dressings and does not wilt. 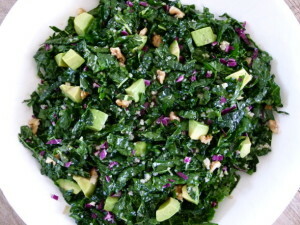 Prep the kale and place in a large bowl. Drizzle with olive oil and lemon juice and use your hands to massage all of the leaves, getting them nice and coated. Let sit for 20-30 minutes to tenderize the kale. Add the remaining ingredients and mix well. Taste and adjust seasonings. NOTE: Use a bag of chopped kale to make the work go more quickly.